Normally I would not share such a scandalous dorky silly picture of myself with the Internet world… however the WordPress Weekly Photo topic intrigued me. 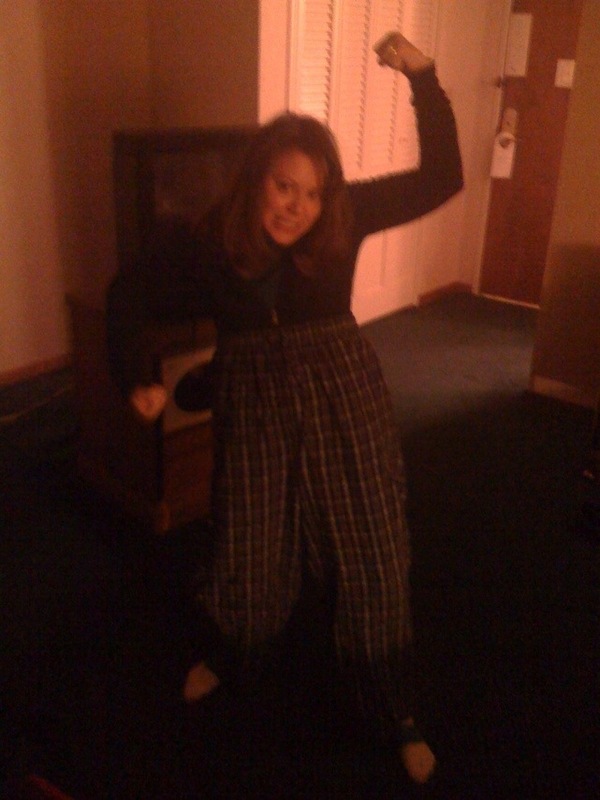 In this picture I am wearing my husband Ryan’s pajama pants. We were in a hotel room in Rochester, MN. We were goofing around and laughing… having a great time. It was the night before my open heart surgery in 2010. We were getting ready for bed and i wanted to make Ryan laugh! I put those pants on and pulled them up to my armpits and posed like an old man flexing… Ryan is 6’4″ and his pants are way to big! Mission Accomplished! This is probably the most ridiculous picture I have ever shared publicly. I am sharing it because even though life gets really hard and we face things that we don’t even understand, we need to remember to take time to laugh… Ryan always makes me laugh… I got to return the favor! And I have No Regrets that he got a picture of it, or that I am sharing it with you! Hahaha! Thanks for sharing this! I appreciate that you comfort others with the comfort that God has given you. My what an amazing sense of style you have. Obviously, you came through your surgery beautifully. Here’s to many more years (free of regret) for you and your husband. Great picture, by the way. That’s so true…when you live as our God wants you to live, then there are no regrets! Keep on laughing and I wish you great health! Thank you Mike for the kind words and for liking my page! Thanks for the lovely comment and for liking my page Mike! I’m still amazed at how everyone is able to make me smile with their takes on regret, a topic I thought was going to be quite a dark one (my photo certainly was…) so thanks for putting a bit of cheer into my day. I am inspired by your ability to goof around like that the day before some pretty seriosu surgery! Paul, your photo is haunting… And also beautifully done. It makes me want to know why you are hurting so much. The pic provokes feelings of empathy in me…I want to sit next to you and just be there and listen or pray with you or just pray for you… Great job on your first Weekly Photo Challenge! God has sustained you and kept you safe even during the time you underwent the surgery just so to inspire others. I’m blessed to have read this post. God bless you. I am blessed by your words. They bring me deep gladness. Thank you so much! God Bless you too! Praise the Lord…looks like the surgery was a success. Gena: I’ve prayed a lot about the tyranny of regret. One day, recently, I woke up and threw if off. Regret doesn’t live here anymore. a night before heart surgery! nothing to regret, that you made your friend happy! Yes, my husband was happy… But we were both happy, and scared and just enjoying our time together.